Strategic Super – Our Super Specialists take care of many Australian families and individuals ensuring the structuring, compliance and administration of their self-managed super funds are done right – providing peace of mind and confidence – from the start. We get to know our clients well.That's how we deliver a personal service. When you call, you talk directly to us; not to a call centre. Your SMSF accounts and administration are done by the accountant you are talking to, they are not sent overseas to be completed. Super can be a delicate topic even in the family. We adhere to strict policies to safeguard your information and protect your privacy. Our strategies complement your advice to ensure you receive maximum benefits and your expectations are met. Once you have a SOA from a licenced financial planner we have an efficient establishment service to convert your current industry or retail super into an SMSF**. Appropriate tax advice which ensures your structure is right from the start. Full administration services ensure compliance with government agencies and independent audits and are provided for a highly competitive flat fee. You benefit from our specialised expertise and knowledge maximising your retirement benefits. Personal, ongoing, individual support. At Strategic Super, we won't treat you like just another file number. You benefit from being able to contact our team at any time – you won't be directed to a call centre or have to deal with "nameless nobodies". Wire-to-wire administration service that includes data entry, SMSF Income tax returns and electronic lodgement, full set of financial reports, Centrelink schedules, Pension compliance and managerial reviews of your SMSF. We constantly strive to give you complete peace of mind, with the knowledge that your SMSF is in good hands. Strategic Super – The Super Specialists take care of many Australian families and individuals ensuring the structuring, compliance and administration of their self-managed super fund is done right – providing peace of mind and confidence – from the start. Note we are not licensed to give financial advice. We will not establish your SMSF until you have a SOA. We are accountants only - please read our disclaimer. Strict confidentiality and security is ensured when entering into all business associations with Strategic Super. You can rest easy in the knowledge that your clients are in safe hands and will receive efficient service. 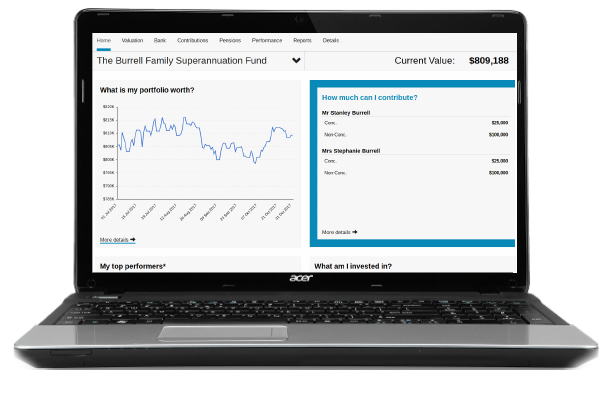 Strategic Super is the preferred SMSF administrator for leading Australian financial planners and investment advisors. They choose Strategic Super because we guarantee a high professional standard and uncompromising confidentiality. We work closely with finance professionals to provide expert SMSF services to their clients while also ensuring all Super Funds under our administration are managed in accordance with the regulations. Expert Services to provide the right guidance on Super strategies, SMSF structures and administration advice. You can call on our team's experience and knowledge of SMSF legislation when you need them. Efficient establishment service to convert your clients' current industry or retail super into a SMSF ensuring it is done right the first time. A well-established network of professional associates with whom we interact in the provision of legislative, operational and SMSF compliance requirements for their clients. Full administration service, ensuring compliance with government agencies and independent audits at a highly competitive flat fee. These services ensure that your clients benefit from our specialised expertise and knowledge while helping your firm to maximise their retirement benefits. Tax minimisation and SMSF Strategies that complement your advice to ensure your clients receive maximum benefits during their working years and in retirement. *We have registered tax agents that can provide you with tax advice in regards to your SMSF. ** You must provide us with a Statement Of Advice (SOA) from a licensed financial planner before we will establish a SMSF for you. Or you can choose to use one of our financial planners on our panel to provide this advice for you. Limited financial advice: Strategic Super is licenced by SMSF Advisers Network PTY LTD AFSL 430062 to provide SMSF advice to existing SMSFs and limited to the following; Deposit accounts (bank accounts and term deposits), Rollovers (post SMSF establishment), Contributions, Pensions and Windups. No advice can be given to establish a SMSF. No investment or insurance advice can be given. For advice that we cannot provide, we can refer you to one of our financial planners on our panel.